Hero Arts | My Monthly Hero July Blog Hop. Underwater Shaker Card. Giveaway! Hello all and thank you for stopping by today to help celebrate the launch of July My Monthly Hero Kit from Hero Arts (more on that below). Let me start by saying WOW! 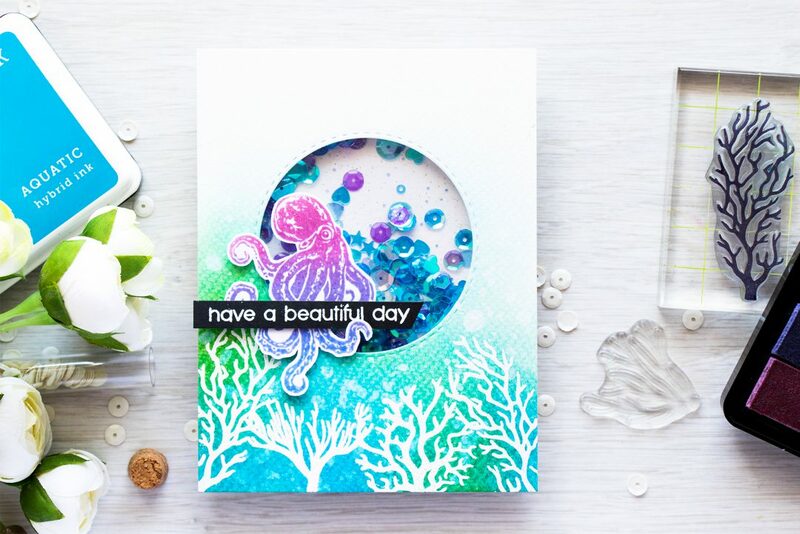 Octopi, tutrples, jelly fish, corals – this is what you can expect to find in the newest Hero Arts kit along with a fun new ombre ink pad that works beautifully for stamping these underwater images. 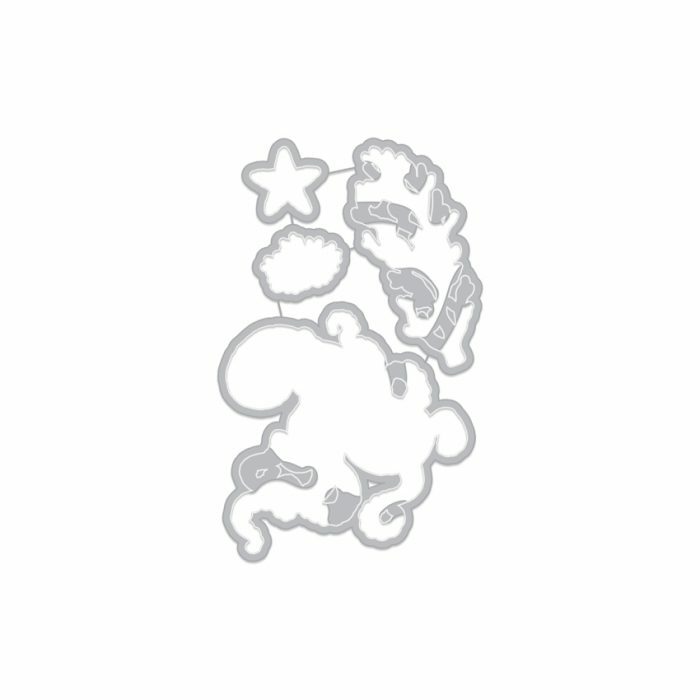 I’ve already shared 3 projects using this kit HERE, be sure to take a look. 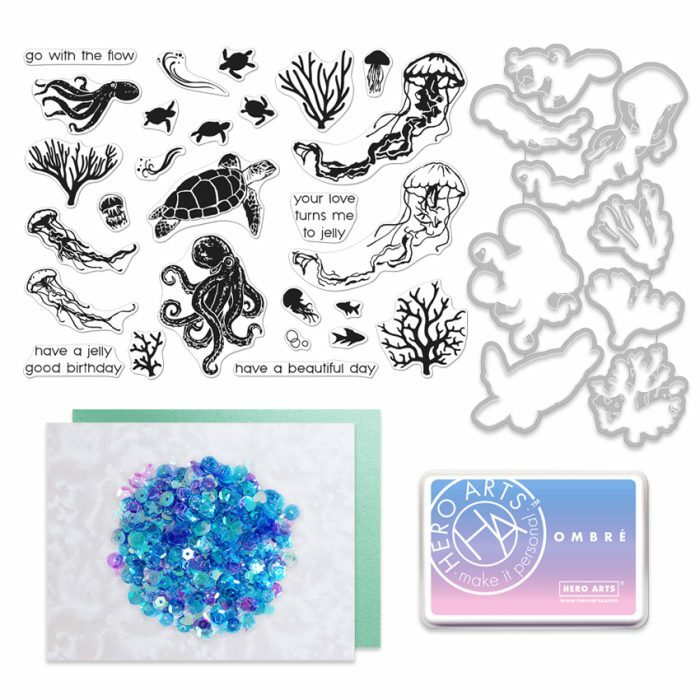 A few words from Hero Arts: This month’s kit features a gorgeous ocean theme, with jellyfish, octopus and sea turtles, and lots of coral. 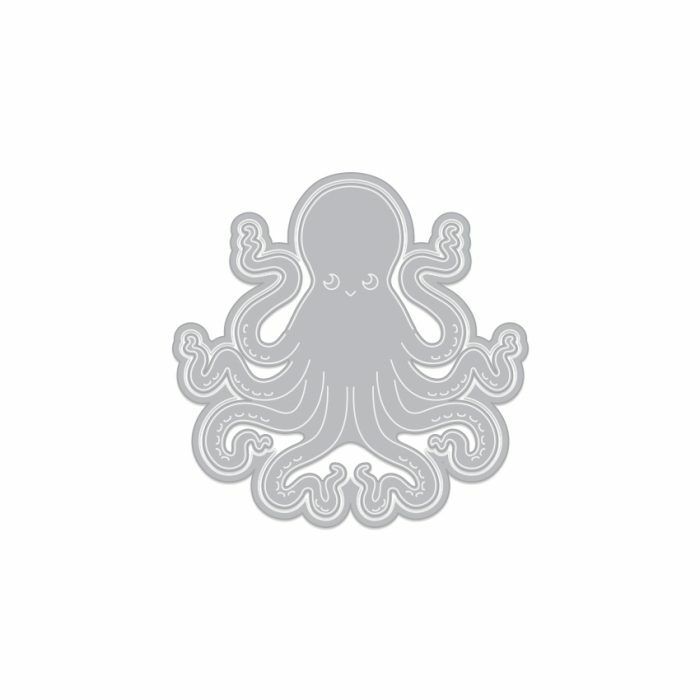 Octopus are very trendy right now – who knew? 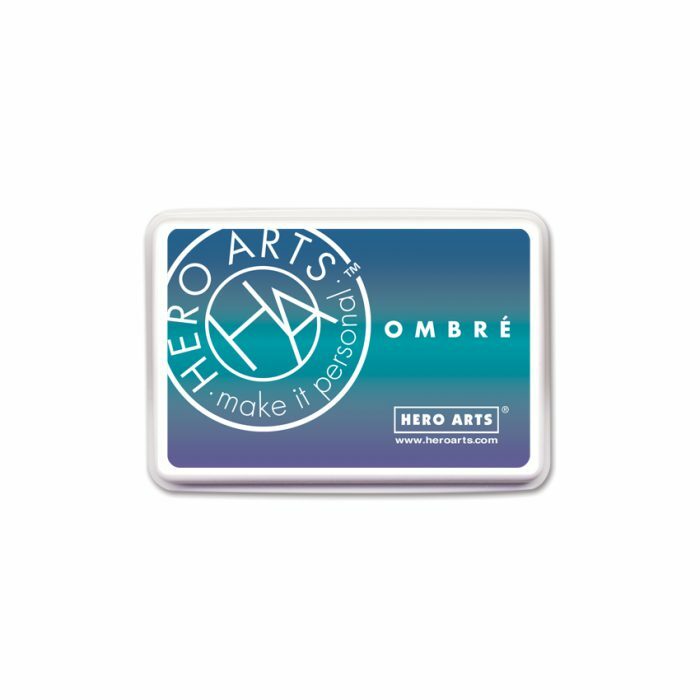 Hero Arts is going to donate 10% of profits for our July 2016 MMH Kit to ocean preservation through the World Wildlife Foundation. I started working on this card by heat embossing images of corals onto Distress Watercolor Cardstock in white embossing powder. 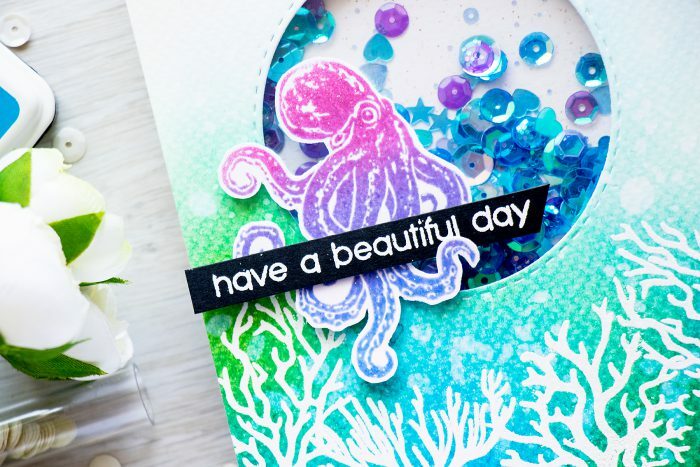 I used images from both main stamp set and Color Layering Octopus add on. Next I blended several colors of distress inks (I have colors listed below) and added drops of water to activate it. I wanted to make shaker card, so I die cut a circle opening in my panel and I used Simon’s Stitched Rectangle die. The shaker was created with the help of Clear Acetate from Hero as well as the sequins mix from the kit. 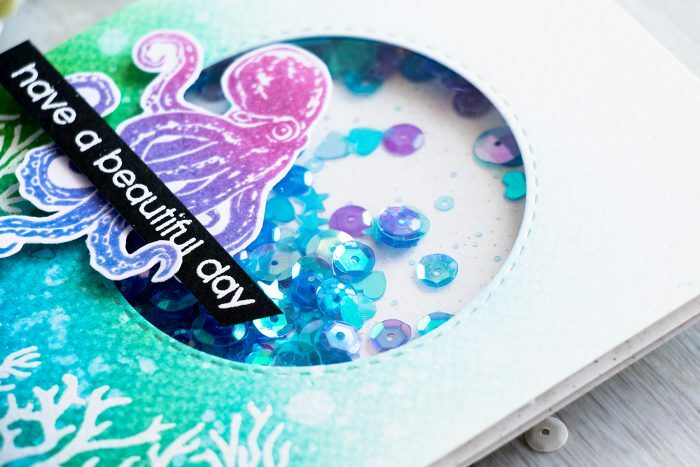 I also stamped and fussy cut the octopus from the main kit, I used the new ombre ink – Dolphin. This guy was foam mounted over the shaker and I also added a white heat embossed “Have a Beautiful Day” sentiment. ** The Ombré Dolphin ink pad is brand new and inspired by the Pantone Color(s) of the Year, a pink to blue spectrum. It is exclusive to the kit through 2016. 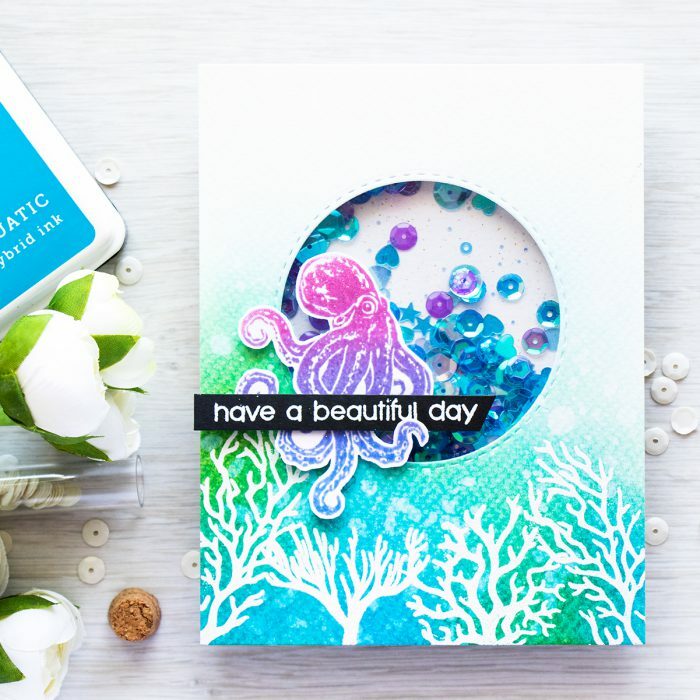 With the large stamp set (equivalent to two 4×6 clear sets), dies and an ombre ink pad, the kit value is nearly $60! Hero is selling this one for $34.99. Amy Tsuruta – next stop! Beautiful card, Yana! Love all these ombré colors! Lovely colors and a beautiful scene. The sequins are great! Love the kit and your card! So pretty! This is such a beautiful card. I love how the colours are so at peace with each other. It’s almost calming! Your card is absolutely stunning! 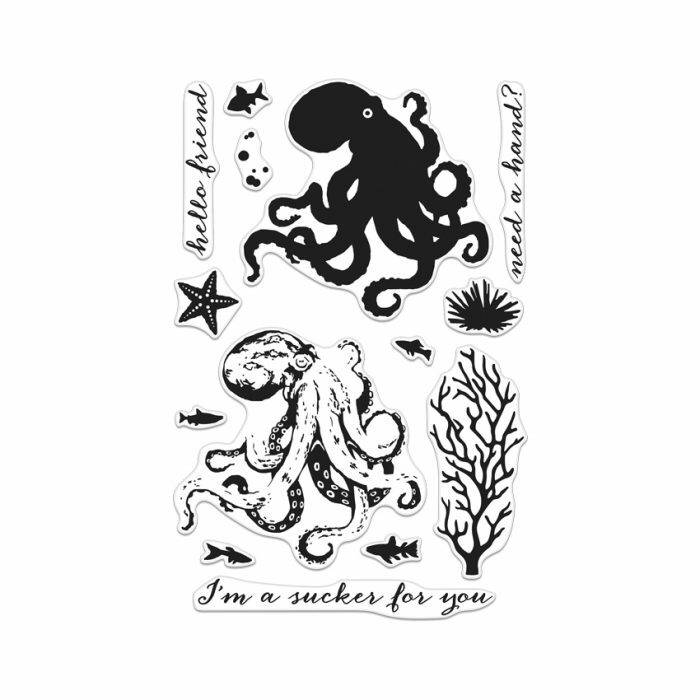 Love how you made the octopus hold the sentiment. Love the awesome colors & the shaker element! You nailed it with this one!! Very exciting release and love they are giving money for a great cause! You sold me on my first kit from Hero Arts. Thanks for sharing! I love all the colors in your card! I also love that you made it a shaker card! I love shaker cards and I have to learn how to make one! I know my family and friends would love to receive a shaker card. You did a nice job, Yana! Trendy stamps, blue ink and blue sequins combined to create this fun shaker. Love it AND the kit. Keeping my fingers crossed I might actually win this kit. Your card makes me want to jump right in!! Lovely! Wonderful shaker card. Love this kit. Thanks for sharing. Beautiful yet peaceful card, Yana! So lovely! I love the use of sequin mix here. Wow … Amazing! I love your shaker and so bright colors <3!! Beautiful shaker card! Love the rich colours. Love love love everything you do, Yana!!! I watch your videos at least three times each. Love your use of color! Love this design and the colors! Gorgeous! Love your white embossing on the corner with the coral! So pretty, great card! Gorgeous card!! I love the colors you used! I really love this kit. I just saw Finding Dory so I’m all about the ocean right now!